On Wednesday I take Tyler to the vet. He’s a fourteen years old, a mixed black lab with arthritic legs and a slowing metabolism. 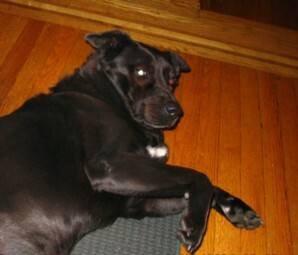 Recently he’s developed Cushing’s Syndrome, a hormonal imbalance of the adrenal glands that makes dogs obese and weak. I thought of him as fat and lazy earlier, but now he has exceeded my imagination. Sad really, because it’s a part of the illness and nothing to do with his greed, which remains unabated. I wonder what he thinks as I bring the car around to take him to the clinic. He loves to ride in the car. What dog doesn’t? He scrambles to get in, not even waiting for the door to open, slobbering on the windows and down the back of my neck until we reach our destination. Now he balks, The floor of the car is too high for him to clamber into and Michael has to lift him in, literally. Usually he walks to the vet. It’s just three blocks total, and every lamp post, tuft of grass and postage size patch of turf needs to be investigated and irrigated. A slow laborious process. Sometimes twenty minutes or more pass before we reach our destination. Those days are long gone now. He’s too weak to walk that far. Even half way around our block is a major effort. He’s become familiar with the sliding glass doors of the clinic. in spite of limping up to them he wants to turn back but there’s no choice, either for him or for me. The blood tests are necessary to determine if he’s taking the right amount of medication. I shudder to think it might be increased. The pills make him sleep a lot. It’s a production to make him swallow them. With other stuff we break open capsules or crush tablets and mix it in his food, but this drug is toxic to humans (maybe) so he has to be tricked into swallowing them. For a while mixing them in tuna worked, but he learned to sniff out the capsule and leave it on a side while eating the fish. Our latest ruse is to make tiny slits in cocktail franks and push the capsules into them. He loves sausages of all kinds. I’m sure he knows there’s something else inside but hey, he’s a dog, and dogs will eat any kind of sausage. It seems to be working for now. At the clinic, he looks at me with sad eyes. I feel so guilty I can’t meet his stare. I know I’ll have to leave him there until the evening, and hate it. I wonder what goes on in his head as he lies there on the cold white tiled floor, waiting for me to leave. I’ve heard that dogs have no idea of time. That a day is like a week or month to them. So any separation must feel like abandonment. Maybe this is how older people who live in homes feel when they first go in there, or later still, as people come in to visit, always leaving after a short while. Do these people wonder if that person will ever come back, and when? People have a sense of their own mortality, so at some point it must feel like it is a final goodbye when a friend or relative walks out the door. Do dogs sense their own mortality too. Anecdotal evidence seems to say they do. Maybe Tyler looks at me as I walk away towards the glass doors and wonders if I’m coming back. I try not to turn back, but can’t help myself. I have to look. Every time could be the last time. This entry was posted in Stream of thought by bryanknower. Bookmark the permalink.